[QODBC-Desktop] Troubleshooting - QuickBooks UI getting launched after updating QODBC Version. Troubleshooting - QuickBooks UI getting launched after updating QODBC Version. We recently upgraded from QODBC 14 to 16.00.00.313. It is functioning normally except now the QuickBooks window is opening up when it didn't use to. In version 14 it didn't open up QuickBooks while being accessed, now it does. Is there a way to change this behavior with a setting? 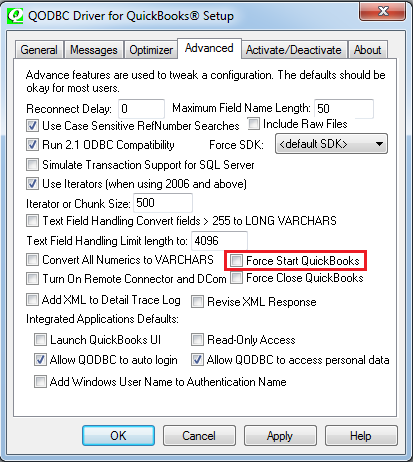 Please disable force start QuickBooks option from DSN you are using. Start>>All Programs>> QODBC Driver for use with QuickBooks>> Configure QODBC Data Source>>Go To "System DSN" or "User DSN " Tab whatever you are using > your DSN >> click "configure">> switch to Advanced>> disable Force Start QuickBooks option and try again.